A city in the Arctic north-west of Russia, close to the Barents Sea and the easternmost part of Norway. Its strategic position made it one of the key naval ports of the Soviet Union, both during WWII, when it served as a lifeline to the Western Allies for supplies, and especially during the Cold War, when it became the base for the USSR's Northern Fleet nuclear submarines. It is precisely for these two periods of history that the city is also of interest to the dark tourist. More background info: Despite a shrinking population since the demise of the Soviet Union, Murmansk is still the largest city north of the Arctic Circle … at currently a bit over 300,000 inhabitants – down from over half a million in Soviet times. It's quite a young city, founded in only 1915/16 as the terminus of a new train line and as a shipping port. It owes its existence primarily to its location on a fjord on the Kola peninsula which is kept ice-free year-round by the last remnants of the Gulf Stream. 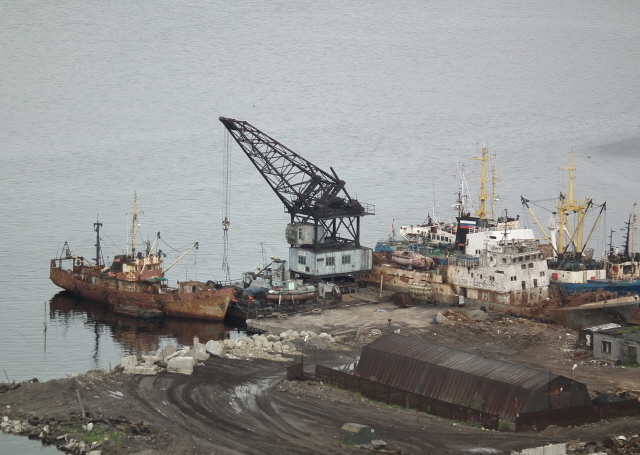 Given that virtually all of Russia's northern coast is otherwise in the near permanent grip of Arctic ice, the strategic importance of Murmansk's harbour can hardly be overstated. This became very clear in WWII, when Nazi Germany, which had already conquered neighbouring Norway, aspired to capture this crucial port as well. Their 1941 "Operation Silver Fox", however, failed in the end. In fact, while the fronts further south were overrun by the German attackers, the Arctic one just west of Murmansk was successfully defended. It was not just the determination and courage of the Soviet forces of Murmansk that made this possible – German errors and ill-preparedness for the tough terrain also played a part. The importance of Murmansk in the "Great Patriotic War" (as WWII is known in the ex-USSR) was later especially recognized by declaring it one of the "Hero Cities" of the Soviet Union (together with e.g. Leningrad, Stalingrad, Minsk, Sevastopol, etc.). You'll see references to this title all over the city still today. What is less frequently spelled out is that the war in these parts was not just about the port of Murmansk but also about access to the nickel mines of the Pechengsky district, especially the one at the eponymous mining town Nikel … where the associated pollution continues to this day (see below under dark combinations). If anything, Murmansk harbour's importance grew even greater in the Cold War, at least in strategic military terms. It became the home base for the Northern Fleet's nuclear submarine arsenal. The region still is home to contemporary Russia's submarine-based nuclear deterrent, but the actual naval bases are now further north in the Kola fjord, e.g. at Severomorsk and Polyarny, plus more along the Barents Sea coast. The fleet of nuclear icebreakers is also based at Murmansk/Severomorsk. The associated long-term risks of radioactive pollution are a major security concern, especially as the storage of spent fuel and old reactors (some in the open air with just minimal protection) is far from ideal – see Murmansk region nuclear submarine bases and wrecks. In addition, nuclear submarines lost just off the coast in the Barents Sea are a nuclear pollution time bomb. For instance, the "Komsomolets", which sank in 1989, still lies on the seabed over mile down, with its two nuclear reactors and at least two nuclear warheads still in place. How long it will take for it to rust through and leak radioactivity is anybody's guess – but it's undeniable that she poses a massive threat. The most infamous case of all nuclear submarines lost at sea was probably the "Kursk". Its sinking in August 2000, with the loss of all hands, was not only a major tragedy it was also a massive PR disaster for the post-Soviet Russian Federation under its new president Putin. Its mishandling of the disaster, complete with botched rescue attempts (while some still alive on board could have been freed but were left to slowly suffocate), the refusals to allow international help and stony-faced silence and public lies by officials looked like nothing had changed since the Soviet era. Eventually, at least, the wreck was raised from the seabed in a costly operation in 2001. Much later, a piece of the wreck, salvaged in 2009 from a scrap metal dealer's yard, finally found its way into a monument for perished submariners in Murmansk – which makes for a veritable pilgrimage site. Since the dissolution of the Soviet Union, the naval bases of the Northern Fleet were restricted to various locations north of Murmansk proper, and the city finally "opened". So it is possible to visit as a tourist these days. Not that it will ever be a major tourist draw, but those with a penchant for remnants of the old Soviet era will definitely get something out of such a visit. What there is to see: In a way you could say that simply travelling to Murmansk is as such a very exotic thing to say the least. I mean the name alone! It conjures up associations with extreme remoteness – a bit like with Timbuktu or Vladivostok. So the coolness factor in that sense is already high. It is the legendary "Lenin" – the world's very first nuclear-powered icebreaker, in fact the first civilian nuclear vessel of any kind. After 30 years of service in the Russian High Arctic between 1959 and 1989 it was finally retired and is now permanently moored as a museum ship in Murmansk's harbour not far from the train station. Visitation is by guided tour only, four times a day. Individual/independent visits are not possible. The ca. 60-minute tours are normally in Russian only. English-language group tours would have to be arranged in advance. But even if you don't speak Russian it is worth it just for what there is to see – much of which is fairly self-explanatory anyway. There were quite a few non-Russians on the tour I went on – I definitely heard some Italian being spoken. So it isn't all that unusual to tag along regardless. The guide, by the way, actually was quite fluent in English too, as I found out afterwards in the gift shop (I just had to buy the T-shirt!). It's just that the tours cannot be conducted bilingually as it would simply take too long to say everything twice. And demand for English-language-only tours is generally just too low to be offered on a regular basis. On the tour you get to see at least the following: the officers' mess and casino, the captain's salon, the bridge, and deep in the bowels of the ship you can see various parts of the machinery that kept the "Lenin" going. This includes not only one of the steam turbines but also, yes indeed, the reactor! Well, to be precise, you can only peek into the reactor room through a special safety window … even though the spent fuel has been removed many years ago. Probably in order to make for a more realistic impression of vintage nuclear hi-tech, a couple of dummies in white lab coats have been placed inside the reactor room. It is a bit eerie in any case. Models and diagrams of the reactor's inner workings illustrate the topic further – only graphically, of course, unless you can understand the Russian-only labelling. In any case, I found it very exciting to get to see a nuclear-powered vessel from the inside … I had never been on any such thing before. Cool. I've heard rumours of plans that an old submarine, possibly the K-3 "Leninsky Komsomol", the USSR's first nuclear-powered one, is to join the "Lenin" on the berth opposite, also serving as a museum. But when I visited Murmansk in August 2012 there was no sign of any submarine anywhere and I couldn't find out any information about this from my tour organizers either. We'll have to wait and see whether it will indeed ever materialize. If so it would be a fitting addition to the "Lenin", celebrating the other part of the city's nuclear naval legacy. Across the bay you can make out some sort of war memorial involving anti-aircraft guns and missiles as well as the typical fighter-plane-on-a-stick-design, in this case two specimens, in fact: one is an old WWII fighter the other a much larger Cold-War-era Su-15 jet. Whether the site is visitable close-up I do not know. The place is apparently called Abram-Mys (or so). Easily the grandest of all war memorials in Murmansk itself, and an absolute must-do during any visit to the city, is the famous "Alyosha". That's the nickname (a diminutive of Aleksey) that everybody uses to refer to the giant statue of a great-coated concrete soldier standing on a hill just north of central Murmansk overlooking the harbour and the bay. The official name of the monument is "Defenders of the Soviet Arctic during the Great Patriotic War" – indicating what it commemorates: the defeat of the Germans in WWII (see under background). It is indeed a massive statue at ca. 35m (116 feet) without the pedestal. Allegedly this size makes it the third tallest Soviet statue after the two Motherland statues in Volgograd and Kiev. At Alyosha's feet an eternal flame still burns – which by no means goes without saying these days, as many such eternal flames of old Soviet glory have long been extinguished. The site appears to be well maintained in general, with fresh flowers and wreaths in evidence – and: even some British contributions. When I visited there was one wreath of red poppies as well as a little wooden cross with a single poppy, explicitly dedicated to "all who served in the Arctic convoys". The date indicated it had been left just weeks earlier! Also part of the memorial complex are a couple of old anti-aircraft guns and plaques spelling out the names of the other "hero cities" of the Soviet Union, such as Stalingrad (see under background). 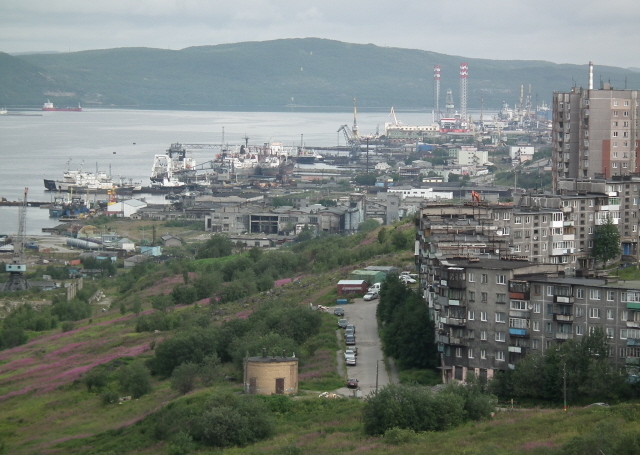 From the vantage point of the Alyosha statue's hill you can get the best views over Murmansk harbour, both south to the merchant navy ports right by the city centre, with the giant coal loading facilities, as well as north to yet more shipyards – including some that were clearly hosting naval vessels. 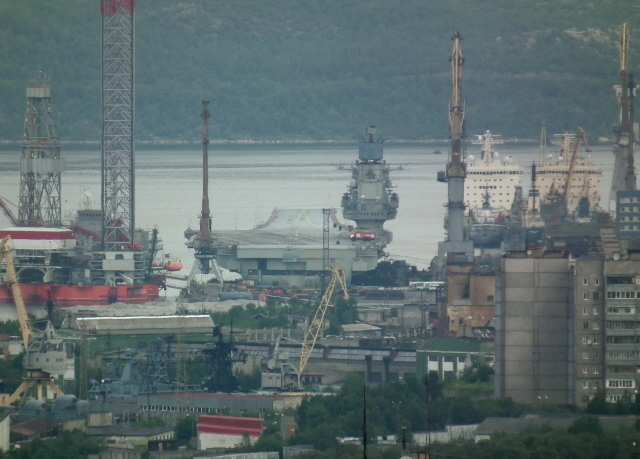 When I was there, a huge aircraft carrier was berthed right at the top of the headland, before the bend of the fjord towards the main naval base port town of Severomorsk. This is probably as close as you can so easily get as a tourist to any of the many Navy installations in the region. 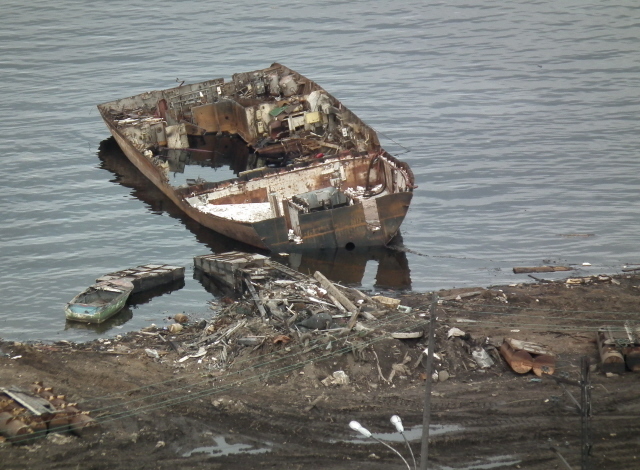 Directly below at the foot of Alyosha's hilltop location you can see a ship cemetery – or rather: scrapyard, with various old rust buckets awaiting or undergoing dismantling. For weird people like me who are attracted by dereliction, such a sight is also a bonus. One place I didn't manage to get to during my short visit to Murmansk was its Naval History Museum or Museum of the Northern Fleet (sources vary as to what the exact name is), which allegedly also has bits about the nuclear vessels. The museum is on the northern edge of the city. I would presume all labelling will be in Russian only and exhibits will mostly appeal to naval history buffs only – so it won't be worth it for everybody. Decide for yourself. Not having seen it, I can't make any first-hand comments. Otherwise, Murmansk generally offers the weirdish, darkish delights of remnants from the Soviet era that some tourists (me included) find quite intriguing. These relics come mainly in the form of plaques and monuments from that Soviet era that were simply left in place even after the demise of the Eastern Bloc. In quite a few of them, it even still says "CCCP" (i.e. USSR in Russian)! Red stars as well as hammer-and-sickle emblems are abundant too. On Lenin Avenue there is – need I spell it out? – a Lenin statue that's still surviving too, slightly set back from the road in a small park-like area on the eastern side of the road. Monuments, plaques and other references to the city's icebreaker fleet abound too – there was even a paining of the "Lenin" in my hotel room! … and finally: of course, Murmansk, being as far north as it is, is quite literally dark much of the time, namely during the winter – and the Arctic winter offers good chances of seeing Northern Lights here. Location: The city of Murmansk lies on the eastern shores of a fjord that cuts deep into the northern coast of the Kola peninsula, on the Barents Sea in the north-westernmost part of Russia, ca. 1000 miles (1500 km) north of Moscow, 600 miles (1000 km) north of St Petersburg. Much nearer is Kirkenes, only 100 miles away (160 km –as the crow flies), just across the border with Norway. The "Lenin" icebreaker is just half a mile or so from the city centre, just west of the central train station, across the bridge and a short walk north and then west. The giant Alyosha towers over the city, visible from many parts of town, on a promontory north of the main merchant navy harbour, ca. 2 miles (3 km) north of the city centre. The "Kursk" memorial is behind the old lighthouse tower, which is by the main road north (called ulitsa Chelyuskintsev at that stretch), a good mile (1.7 km) from the city centre. The Naval Museum is much further north, over 4 miles (6 km) away, at 15 ulitsa Tortseva. Access and costs: astonishingly easy to get to – considering the remote location. Not necessarily expensive either, though organized tours from neighbouring Norway can be somewhat costly. Most foreigners will require a Russian visa! Details: Getting to Murmansk from within Russia is easy. There are direct train connections e.g. to St Petersburg or Moscow (ca. 36 hours), as well as buses and flights. From abroad, it is easiest to get to the city from neighbouring Norway. Note, however, that you have to be in possession of a Russian visa, even for a short day trip, and this has to be applied for well in advance in your home country (costs vary between ca. 30 and over 100 EUR, depending on citizenship and type of visa). There are a few direct flights a week from Tromsö. But given the proximity of Murmansk to the Norwegian border, overland transport is a good option too: there are regular minibus services from the border town of Kirkenes (ca. 5 hours). A couple of operators based in Kirkenes also offer various tour packages as well as visa application assistance. The one I went on used the regular minibus service for the outbound journey and a private taxi transfer for the return (due to unfavourable bus departure times). The latter pushes the price up a bit, naturally, but you pay for the convenience. As an optional service they can also organize a bilingual guide for your time in Murmansk – but tailoring a regular city tour to dark-traveller special interests may be a bit tricky. I preferred to make do without a guide. Getting around Murmansk independently is a bit demanding for the foreigner if you want to use public transport – but there are buses and trolleybuses. If you feel up for it, walking is logistically the easier option. The distances are great, but I found it doable to walk from my hotel in the south of the city centre all the way to the "Kursk" and Alyosha monuments and back into town via the "Lenin" icebreaker in ca. 5 hours. You'd want halfway decent weather for this, though. Getting to the Northern Fleet Museum is another thing. This probably does require a bus journey. Line 10 is supposed to get you the nearest to it. Get out at the last but one stop, called Nakhimova, on ulitsa Admirala, carry on walking for a few hundred yards and then take a left turn. Accommodation options in Murmansk may not be quite as plentiful as in other such significant cities of this size, but they include quite good ones in modernized, Western-style hotels in decent locations (including at least one of a well-known international chain). The iconic Hotel Arktika on the main "Five Corners" square, the tallest high-rise building north of the Arctic Circle, was still undergoing renovation work when I was there (in August 2012), but it may by now be a very good option to look into, if only for the maximally central location. Food and drink are notably cheaper than over in Norway, naturally, but choices are a bit limited, especially for foreigners who don't know any Russian. In that case, making do with what the international hotels offer may be the easiest option. Speaking of the language barrier: some Russian language skills will come in very handy in this faraway place. Don't expect many people to readily speak anything other than Russian. At the very least, you should be able to read the Cyrillic alphabet, otherwise orientation may get difficult. In the international hotels English is usually spoken by at least some staff. The guide onboard the "Lenin" icebreaker was quite fluent in English too – even though the tour as such was in Russian only. English-language tours can be arranged in advance, but only for groups. Regular tours of the icebreaker (you cannot visit it individually) take place hourly between noon and 3 p.m. – it's best to turn up with a bit of time to spare as you may have to wait for the next tour if the previous one is already full. And they can fill up quite rapidly at times. Charges are 150 RUB (for foreigners – Russian citizens pay only 100) for individuals. Group charges may vary. The Naval History Museum is open Thursdays to Mondays 9 a.m. to 4 p.m., admission 100 RUB (Russian citizens 50 RUB) – at least these are the figures I found online. I wasn't able to verify them in person. The Alyosha and "Kursk" memorials can of course be visited for free at any time. Time required: When I visited Murmansk in August 2012 I had to make do (for logistic reasons) with just a two-day/one night arrangement from Kirkenes. I arrived in the evening and on the next day had till ca. 3 p.m. – so not much time. But I managed to cram in the "Lenin", the Alyosha and "Kursk" monuments and got a general impression of the city as such. I did not, however, have the time to make it out to the Naval Museum, which is a bit of a regret. So, in order to really do the city justice it would probably be better if you could make it at least two days/three nights. Combinations with other dark destinations: By far the darkest aspects of this part of the world are the Murmansk region nuclear submarine bases and the associated wrecks and spent fuel storage facilities … but actually seeing any of these as a tourist is near impossible. Another infamous place you are not normally supposed to visit is Nikel, the closed mining town with its heavily polluting Norilsk nickel smelter plant near the border with Norway. To actually enter the town itself you'd need a special permit from the FSB (formerly KGB), as all these border area towns are normally closed to foreigners. However, you'll drive past it if you're getting to Murmansk from Kirkenes. You can even see the smokestacks from the Norwegian side of the border. But only when you drive by can you see the post-apocalyptic industrial wasteland of the plant/mines from a bit closer up. A whole set of smokestacks are constantly belching out bluish and brownish fumes. And for miles around, the whole landscape is barren and brown – made almost lifeless by the pollution. It's a breathtaking sight in more than one way … You can only pity those people who have to live in the prefab residential blocks just down the road from the source of all those toxic emissions. Also en route between Kirkenes and Murmansk you pass a few active army bases, with tanks, watchtowers and various war memorials clearly visible from the roadside. One of these military bases bears the glamorous name of Sputnik (as in the first Soviet satellite). The whole area is littered with relics from WWII as well – including old shells (UXO?) and other bits and pieces of rusting metal and old fortifications. But you'd need specialist guiding to specifically locate any of these things. One exception of sorts is the ropeway system left by the German Wehrmacht – the "Murman-Seilbahn" – in the Pechengsky district. Apparently this was used to help supply their troops in this tricky terrain. By a roadside service stop, where the driver of the bus I was on took a break, a bilingual panel could be found. This even claimed that the Murman-Seilbahn was the longest such system ever built. Not much of it is to be seen today, though. Instead a few old Soviet-era vehicles adorn the place as open-air exhibits of sorts. If you carry on over the border to Norway, Kirkenes has more to offer to the dark traveller in these parts, including a museum about the borderlands and the effects that WWII and the Cold War had on the local communities (Grenselandmuseet) as well as an old cave/bunker system that the civilian population held out in during the frequent air raids (Andersgrotta). Combinations with non-dark destinations: Not much. The city of Murmansk itself really isn't the prettiest and offers very little of the typical Russian architecture, a couple of (not very old) Orthodox churches notwithstanding. It's mostly grey, bland prefab apartment blocks so typical of the whole Eastern Bloc. So there isn't really enough to make it a mainstream city-break destination by any stretch of the imagination. For those after the great outdoors, however, Murmansk is an excellent departure point for camping, fishing, hiking trips into the Kola peninsula, an area of stark Arctic beauty, with tundra and forest almost untouched by humans (if you don't count the military and mining activities, that is). There are a couple of specialist organizers of such nature-oriented trips. Don't expect any luxury, though, it's rather adventure tourism more than anything else. Finally, Murmansk is also the embarkation/departure point for the most exceptional cruise that's on offer in the northern hemisphere: to the North Pole! In a 74,000 hp nuclear-powered icebreaker that is capable of literally forcing its way to the spot of 90 degrees north, even through 10-foot thick ice. Unfortunately, this most exclusive Arctic adventure of them all is also one of the most expensive things a tourist can do. Prices start at ca. 20,000 EUR per person!